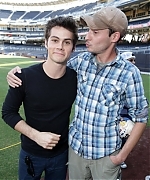 Dylan O'Brien Daily » Photos from Comic-Con 2013! Dylan attended Comic-Con yesterday and I have added pictures from the Teen Wolf panel, The Maze Runner panel, and MTV2 Party In The Park! Check them all out in the gallery!